Growing up in pre-war Germany, Werner Hirschmann was always fascinated with ships and the sea and dreamed of becoming a naval officer. In 1940, he was accepted as a cadet in the Kriegsmarine and after years of rigorous training, became an engineer officer in the elite U-Boot Waffe or submarine service. With the assistance of the Canadian historian, Donald E. Graves, Werner Hirschmann uses his wartime diaries and his remarkable photograph albums, as well as historical documents, to recount the many interesting episodes in his naval career, including serving on a destroyer that escorted the Bismarck on her last voyage, patrols in the Mediterranean and North Atlantic, and being besieged by the U.S. Army in Lorient, France, before escaping to Norway. In 1945, Hirschmann's boat, U-190, sank the last Canadian warship to be lost during the war and he later ended up in a Canadian prison camp. 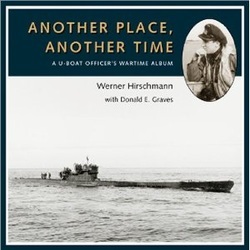 In Another Place, Another Time, Werner Hirschmann describes the training and daily life of a U-boat officer, life and love in wartime Germany, his experiences as a prisoner of war in Canada and his postwar life in Canada. An additional feature of this book is the technical section that provides a detailed pictorial tour of the Type IXC/40 U-boat, based on previously unpublished photographs recently discovered in the Canadian archives. Details: Hardcover, 9" x 8", 255 pages, more than 200 photographs, illustrations and maps, bibliography and index. "In his superb book Hirschmann is constantly aware of how close he was to not making it through. The accompanying fresh and previously unpublished wartime photographs are free of the too-often gritty quality of official U-boat photos. His book is unique in the now vast panoply of books about submarines, often put together long after the events by a galaxy of authors who were not there at the time. Hence Hirschmann's book current book, written in conjunction with Canadian Naval Historian Donald E. Graves, is not only for naval veterans, nor the expanding community of naval "buffs". It will also fascinate the general reader who is both curious and ever more fascinated about an elite naval service." "Many high-quality production standards are found in this book - well-reproduced photographs with informative captions, clear maps and attractive page lay-out and sturdy binding. Hirschmann's collection of photographs is extensive and many of his pictures are several cuts above ordinary snapshots.... U-boat books obviously feed a thriving niche market. Given the ongoing torrent of such works it's worth considering whether Another Place, Another Time offers new insights. In fact, this account is unique because it tells how a young German experienced wartime officer and submarine training......The value of Another Place, Another Time is its first-hand descriptions of all aspects of wartime service in U-boats." "[Hirschmann's] book, on the text alone - ignoring the splendid photos, maps, and documentation - may become a classic personal memoir of one sailor's war. …… This memoir is not overladen with the dangers and their anguish and dread for those who manned the U-boats, particularly after the battle of the Atlantic turned against the Germans by late 1943." "U-boat books obviously feed a thriving niche market. Given the ongoing torrent of such works, it's worth considering whether Another Place, Another Time offers new insights. In fact, this account is unique ...... The value ... is its first-hand description of all aspects of wartime service in U-boats. The Canadian aspects -- the glimpses of how members of the Kriegsmarine saw their Canadian captors and of how POWs experienced Ontario -- are a bonus. " "Commissioned by the Canadian Naval Memorial Trust, which maintains HMCS Sackville, a wartime corvette berthed in Halifax, the book is meant to sensitize a broad readership to Canada's pivotal role during the campaign; it is also a tribute to the sailors' endurance and sacrifices. Graves reviews Canada's naval history to 1939 and then takes readers through the different periods of the Atlantic war, including the difficult days of 1941-42, the RCN's mid-war training and equipment crises, and the Allies' technological breakthroughs and intelligence successes that cemented the U-boats' doom. Each chapter properly places the RCN's operations in a broader context and is supplemented by excerpts from the Salty Dips series of oral history testimony from Canadian naval veterans. With drama and immediacy, they describe a deadly and determined enemy, atrocious weather, exhaustion, fear, survival, and, ultimately, victory. The book's excellent layout allows for many user-friendly sidebar explanations and graphics of such complex subjects as anti-submarine warfare tactics, the convoy system, and the technical workings of weapons and communications systems. There are 200 rarely or never before seen photos complemented by fine drawings by L.B. Jenson. Taken together, these provide an evocative visual review of shipboard life and routine. Robin Brass Studio has again produced an impressive publication. ... this highly recommended book blends first-class scholarship with an accessible form. " "It is all very personal, never sickly and, as the author admits, at such a remove, it is mostly the "good" bits that get remembered. Nevertheless, his honest accounting of life in a submarine even in wartime, largely boring! and his unembellished descriptions of people with whom he served, both those liked and the others, ring a very true peal throughout this book. No axes are ground and his 50 years living in Canada have not dulled his interests in matters naval. I am quite confident that all who have served in submarines at any time will really enjoy this book and probably so, too, will anyone with an interest in what it is that makes people want to follow their career choice through both good times and bad. Thoroughly recommended." "This beautifully-produced book offers the compelling memoir of a German naval officer who, while serving aboard U-190, surrendered to Canadian forces in May 1945. This crisply written, evocative text is expertly blended with solid historical research and a very large number of superb, mostly unknown, photographs and other illustrations. Another Place, Another Time adds to our knowledge of the U-boat service, and in particular of operations of direct importance to Canada. Hirrschmann's fascinating, fast-paced story is sensitively told and difficult to put down. The book is typical of the excellent work being produced by Robin Brass Studio."